ArcGIS Desktop enables the staff to work in personal and file geodatabases. GIS-based maps enable the school to assess emergency situations more quickly. GIS is very useful where many different agencies converge on a scene. As students begin a new semester at Louisiana State University (LSU), Baton Rouge, Louisiana, the school's security office takes a new course of action to keep its college community safe from damage from future hurricanes, like Katrina, with the assistance of the U.S. Army Corps of Engineers (USACE). The corps is working with the school to create GIS maps to make Louisiana State University a storm disaster-resistant school. The Pete Maravich Assembly Center is a large indoor basketball arena on the LSU campus that was used as a medical special needs shelter in the aftermath of Hurricane Katrina. Credit: Jim Zietz, LSU Public Affairs. 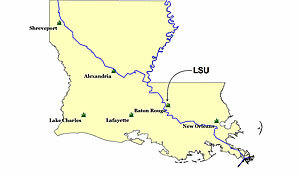 LSU wasn't damaged by Katrina, but the university still remains vulnerable to future hurricane damage due to its proximity to the Gulf region. Louisiana is a coastal state that faces possible threats from hurricanes and tropical storms year-round and especially during hurricane season. 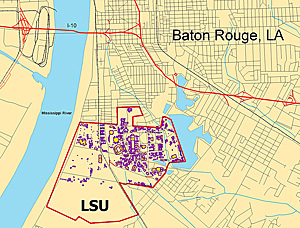 LSU is like a city within a city, and the corps is mapping the 2,000-acre campus using GIS so that when a disaster occurs, the university will have maps electronically available to help guide personnel through the emergency situation and save lives. "The main function of these GIS-based maps is to save lives by reducing the amount of time it takes for emergency personnel to assess a given situation," says Keith Koralewski, hydraulic engineer, USACE, Buffalo District, who provided GIS services for various operations in Louisiana. 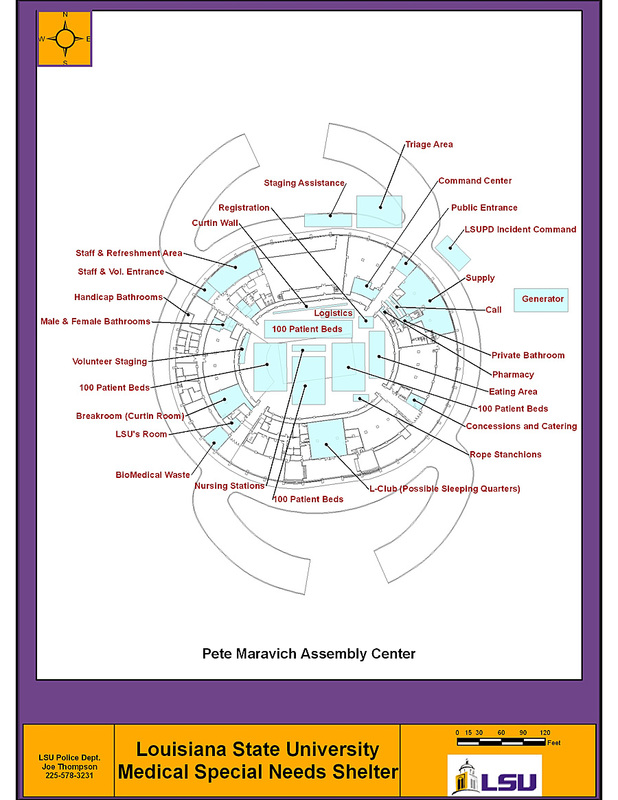 The Pete Maravich Assembly Center mapped out in GIS. The center is being prepped to be an improved medical special needs center in the event of future hurricanes. Credit: Data provided by Joe Thompson, Police Officer, LSU Police Department and Graphics provided by Roger W. Porzig, Jacksonville District, U.S. Army Corps of Engineers. The team linked building information into the school's safety database, including building names, number of rooms, classroom numbers, room layout, square footage, and professors' names and phone numbers. "If an emergency occurs in a particular building," says Koralewski, "they could pull up the GIS map, click on the building to see where the emergency exits and fire extinguishers are, and be able to contact professors or other personnel who are normally in that area of the campus. If a certain area of the building is damaged, this info can provide them with an idea of who may be trapped." The GIS software of choice for both the university and the USACE is ArcGIS Desktop. "We are using this program because this is the system in which our customer, LSU, wants the data delivered," says Roger W. Porzig, Jacksonville District, USACE. "LSU security is already running ArcGIS Desktop, so it was natural to use this platform to structure and deliver the data." Joe Thompson, police officer, LSU Police Department, says, "If there is a fire in a lab, we will be able to click on that room in the lab and see what chemicals we have presently in the lab, which is info we can provide to the fire department." Thompson has GIS experience and works with the school's IT, IS, and emergency response systems. He worked with the USACE to map out one of the key buildings on the campus, the Pete Maravich Assembly Center, a large indoor basketball arena. The arena served as a medical shelter in the aftermath of Katrina for an influx of New Orleans residents with special medical needs. Now the school wants to better prepare it to serve as a special medical needs center in the event of another hurricane. Josette Pullen, Cartographer, Honolulu District, U.S. Army Corps of Engineers and Joe Thompson, LSU Police Officer map out the university campus using GIS technology. Credit: Brad Mooney, FEMA. "I worked with the corps to digitize drawings of the arena in GIS to create electronic maps of the arena," says Thompson. "I also sat down with LSU's Department of Hospitals and Social Services to determine where beds and medicine would go in the shelter and where volunteers would be staged." He continues, "If a hurricane comes and that shelter is activated to start evacuating people with special medical needs, we basically have maps printed so that the employees working there know where and how to set up the beds, where to store the medicine, and where tables are set up so that we have a smooth operation that gets up and running quicker when we have that emergency response." The ArcGIS software-based maps enable the school to assess the situation more quickly, as opposed to pulling out printed maps that may be obsolete, as roads, parking lots, and buildings may change over time. 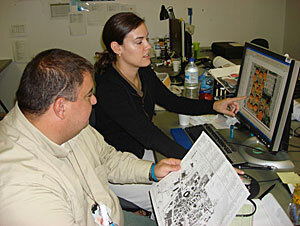 Thompson created the arena maps with Josette Pullen, a cartographer with the USACE, Honolulu District. Credit: Roger W. Porzig, Jacksonville District, U.S. Army Corps of Engineers. Says Pullen of ArcGIS, "With this program, we were able to easily map out portions of the campus. It helps us figure out the projection of different data sources and reproject them to the desired project standard. It enables us to work in personal and file geodatabases. File geodatabases provided us with great capability to store all the project imagery because there are no size constraints. We used personal geodatabases to work with the GIS data. Not only does it facilitate loading attributes from other files easily through a matrix, but you can also open files through their Microsoft Access interface and manage the data. The geodatabase approach is very versatile. Also, these tools helped facilitate the conversion of CAD files into feature classes." Thompson emphasizes, "Having an active campus so when you click on a building, you get the data behind it�this is what GIS is all about." Stephen McDevitt, GIS national action officer with the USACE, New York District, is one of four national action officers responsible for deploying and managing GIS teams throughout the Gulf region to assist the Federal Emergency Management Agency (FEMA) and other agencies and volunteer organizations to help get the beaten region back on its feet. "Getting these maps created swiftly and accurately is extremely important to this school because of its vulnerability to hurricanes," says McDevitt. "During a hurricane, these maps will enable the school's security force to rapidly access geospatial data that will help them assess problems that may arise with the school's infrastructure, which will ultimately protect LSU students and staff." 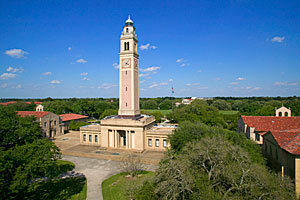 Memorial Tower is a central feature of Louisiana State University's campus. Credit: Jim Zietz, LSU Public Affairs. Rusti Liner, Geospatial Unit supervisor with FEMA, provided the USACE, LSU, and other agencies with resources and overall project management. She says, "Prior to the corps' development of GIS maps for the school, campus addresses were not available, and useful street data had not yet been developed. Simple package deliveries to the campus were major obstacles for staff and faculty. Due to the university's large population and its proximity to nearby rail and rivers, these data layers are vital to first responders." "With GIS maps," says Koralewski, "one can update a map with new information immediately as opposed to paper maps, which may only be updated every couple of years or so. GIS is also very useful for situations where many different agencies may converge on a scene. The agency personnel may not know the area, so GIS maps provide a way for them to get familiar with the layout of the buildings and the campus." 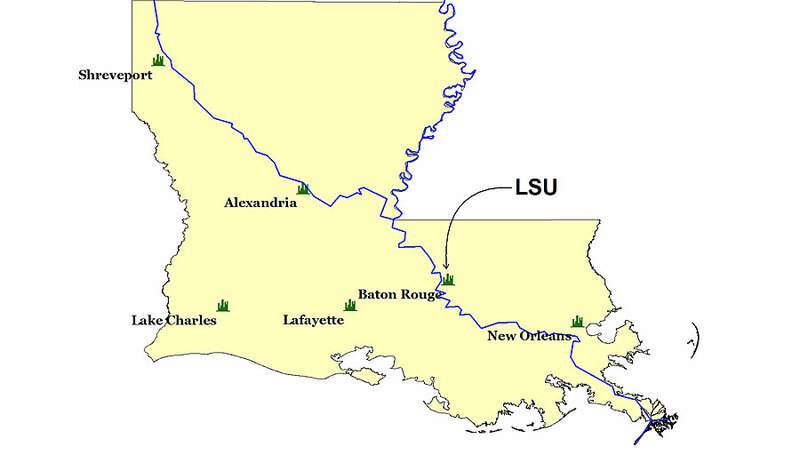 USACE is providing planning guidance to LSU if a disaster hits, which will reduce vulnerability. 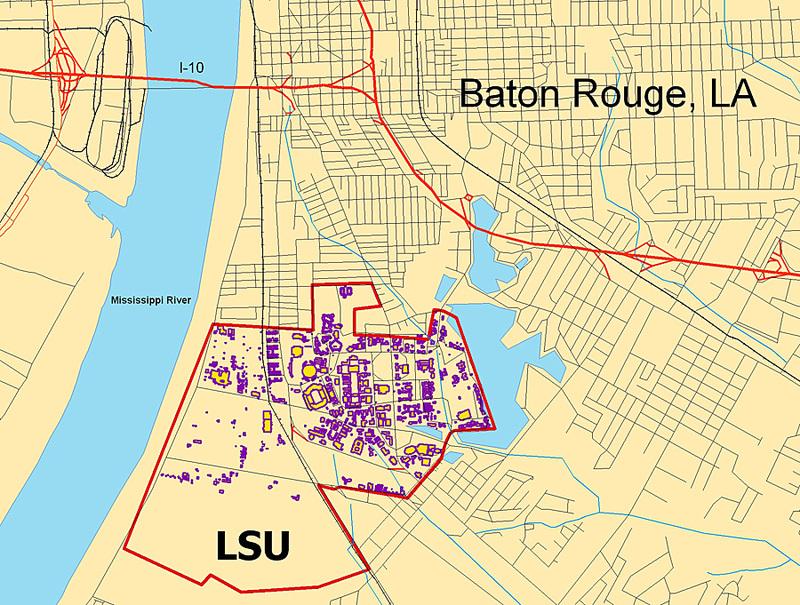 This GIS system will also serve as a basis for a 911 system for the LSU campus. Dr. JoAnne Castagna (Ed.D.) is a technical writer-editor for the U.S. Army Corps of Engineers, New York District. For more information, contact JoAnne Castagna (e-mail: joanne.castagna@usace.army.mil).